In an act of crazy VeganMoFo intertextuality, tonight I made the Maple-Kissed Sweet Potato Muffins posted on Happy Herbivore earlier today. Because this day has been quite chilly and autumnal, I figured that firing up the oven to bake a batch of hearty muffins would be the perfect way to warm up the house and fill up my tummy. 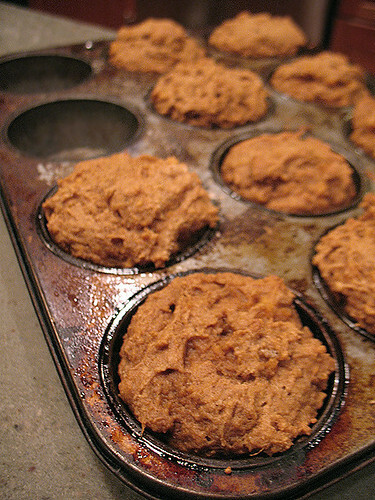 I’m glad to report that my hunch was correct – these are wonderful autumn muffins. They’re sweet and slightly spicy and wonderfully rich. My only complaint was that they came out just the teensiest bit gummy; perhaps I should have baked them longer. Overall, though, they’re a fabulous stand-in for the traditional pumpkin muffin, and I enjoyed using a few more of the locally-grown sweet potatoes we picked up a week or so ago. Now I’m off to grab another muffin and plop myself in front of the telly – it’s Office night! Wow, sweet potatoes in muffins sounds like a wonderful idea.